Bjarke Ingels. Ring any bells? If you’re an architect, planner, developer or proud Dane, you know Ingels is the man behind BIG, the award-winning architectural firm that’s reshaping the skyline of Lower Manhattan with the VIA 57 West apartments in Hell’s Kitchen and Two World Trade Centre. BIG is also behind Vancouver House, a luxury condo that seems to twist into the sky at the north foot of the city’s Granville Bridge. Everything Bjarke Ingels Group creates looks a little bit different from the stacked boxes that fill the air of most urban spaces. So naturally, we’d like to know a little bit more about Bjarke Ingels. Is there anything unique about this wunderkind recently honoured by the Louis I. Kahn Award, presented by the Philadelphia Center for Architecture and Design? In one of the more verité moments in Kaspar Astrup Schröder’s new documentary portrait Big Time, Durst explains why he hired BIG over all the other talented competitors. “He listens… his ego isn’t so big…” Durst said he’s worked with other architects who simply put down their pencils in open rebellion. Ingels, he said, recognized the importance of working with a client. 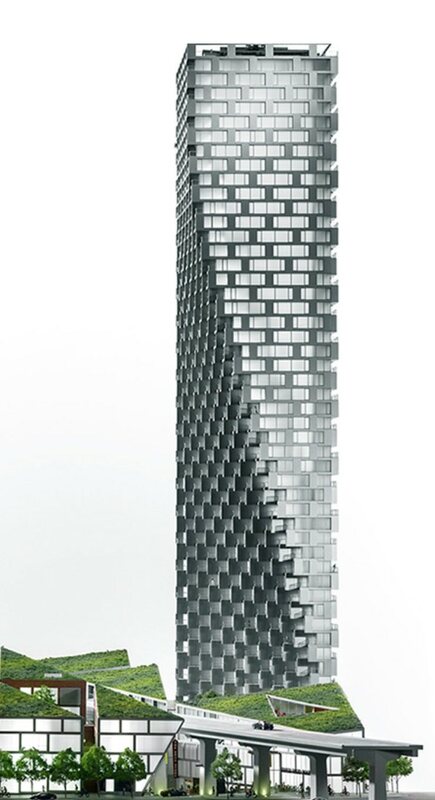 Vancouver House: A Luxury Condo Tower in downtown Vancouver that used its Bjarke Ingels Group blueprints for marketing mojo. Yet, the man we follow over the of course five years — from his award-winning LEGO house to the creation of the New York office and the contract for two signature buildings in the Big Apple — is far from what you’d call easy-going. Architecture is all about balance, and while Ingels finds it in every structure he touches, he’s unable to find it in his own life. Schröder exploits the tension, even heightening a sense of doom by showing us repeated MRI scans of a brain. The threads come together by the latter half of the film, as Ingels finds himself forced to step back and re-evaluate his own ambition. The rest is pretty much pursuit. We follow Ingels through every doorway, and what seems like every boardroom, as he and his colleagues discuss everything from chair design to wallpaper. So much of it seems tedious, but when you see the concrete grow out of the ground, and the entire piece of make-believe come to life in three walk-through dimensions, it cues an emotional response. Most BIG buildings have roofs you can walk on. Some slope gently. One is even tall enough to provide downtown Copenhagen with a ski hill. The endless cool factor explains Ingels ‘rock star’ status in the world of architecture, and reaffirms his claim to ‘Scandamerican’ king. Yet, there’s a cool factor we never really dig into in Big Time. The self-created persona of Bjarke Ingels is never really challenged, partly because Schroder is too busy just trying to keep up. Moreover, both men are Scandinavian. Both respect the idea of privacy. So the film leaves space. The only problem is the space says little — which is anathema to the underlying concept of design at the heart of the film. Ingels doesn’t fit in a regular box. Yet, Big Time is a regular box of a movie: a highly competent and thoroughly engaging portrait of a young architect. What’s missing is an American Ayn Rand sensibility to give Ingels’s celebrity some palpable context and cultural contrast— a breathless sense of religious purpose about transforming the world with gigantic steel erections. Ingels realized he didn’t have to be big. It’s the most interesting thing about him. Big Time offers all the wonder of seeing the gleaming steel frame, but perhaps spends too little time staring into the hole. Warning! Above clip features Charlie Rose content. Photo above: VIA 57 West in Manhattan is a Bjarke Ingels Group building. Courtesy of Mongrel Media. No Replies to "Bjarke Ingels talks BIG in new documentary"